Sugar is trying to sneak its way into your life, and you may not even be aware of it. How cheeky sugar can be! Carbohydrates are naturally found in fruits (fructose) and grains (starch), for instance, and are needed for proper bodily functioning and for keeping our brains active. However, sugar per se is not necessary for our body to function correctly and is oftentimes added to processed foods like soda, fruit juice, cereal, dairy products, various desserts and sauces (ex. ketchup, BBQ sauce) to give them a sweeter taste. We all know that candy, cookies, cakes are high sugar foods but don’t be duped, know that sugar hides in many everyday non-sweet foods, like tomato sauce, fat free dressing, tonic water, marinades, crackers and even bread (gasp!). Why are these sugar bombs so bad? 1. First off, sugar is empty calories. It provides no nutrients whatsoever, while contributing towards our daily calorie intake. It does not, however, give you the feeling you’ve had enough. We can all relate to having an entire king-size bag of candy at the movies and walking out afterwards ready for din-din. Needless to say, this can cause weight gain (especially at the abdominal level, the more dangerous kind of fat). 2. Overconsuming sugar can lead to non-alcoholic fatty liver disease (NAFLD), a growing problem in our Western world, which is strongly associated with metabolic diseases. 3. Excessive sugar intake can increase hormones that are linked to increased cancer risk. 4. Sugar can truly damage your heart of gold. A 2013 study published in the Journal of the American Heart Association showed evidence that sugar can affect your heart’s pumping mechanism and raise heart failure risk, due to a molecule in sugar named glucose metabolite glucose 6-phosphate (G6P). G6P has the potential to alter our heart’s muscle proteins. 5. Excess fructose in the diet is linked to leptin resistance. Leptin is a hormone that normally informs us we’ve had enough food and to stop putting food in our “pie-holes” (I think the term pie-holes should be changed to fruit-holes, but hey). Leptin resistance can make us overeat. 6. Sugar may accelerate the aging process. A 2009 study discovered a positive relationship between glucose (sugar) consumption and the aging of our cells. Cell aging can lead to problems of lesser severity like skin wrinkles but also to more dire consequences like chronic diseases of aging. Alarmingly, this may especially hold true when it coms to the aging of our brains, with high sugar diets being linked to memory deficiencies and a decrease in overall cognitive health. As if this wasn’t enough, because of its very nature, sugar can be addictive for a lot of people. Like “recreational” drugs, sugar causes a release of dopamine (a neurotransmitter involved in enjoyment) in the reward center of the brain – wayyyyy more than we were ever exposed to from foods obtained naturally (read: hunters and gatherers likely couldn’t relate). Because of this, people susceptible to addiction may become heavily addicted to sugar and junky foods that contain it. So if you’ve ever jokingly said, “I’m completely addicted to sugar,” you may actually be correct. Now that you know that suga’ likes to play hide and seek, you just need to seek it out. Surprisingly (or not so surprisingly given sugar’s ruthlessness), even savory foods, like ready-made soups and sauces (ex. pasta sauces) may contain added sugar. Beware of the following ingredients when reading the ingredient list as sugar has many disguises, but sugar by any other name is still sugar: syrups (ex. rice syrup, barley malt syrup, corn syrup, maple syrup, etc. ), concentrated fruit juices (ex. concentrated grape juice), anything that ends in “ose” (ex. glucose, fructose, maltose, lactose), molasses, maltodextrin and sugar (ex. cane sugar, coconut palm sugar, turbinado sugar, etc.). Remember: honey and maple syrup are natural sweeteners yet still count towards your daily “added sugars”. One tablespoon of either provides the equivalent of 4 sugar cubes. Use these sparingly. 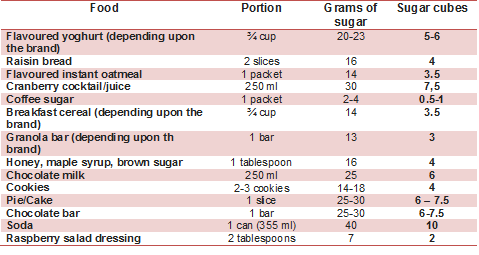 Try reducing the amount of sugar you add by half and gradually wean yourself off. Or, you may want to simply reduce the frequency of foods/beverages you add sugar to such as coffee, tea, pancakes, waffles, etc. Instead of sugar, try adding grated ginger, nutmeg, cinnamon, extracts (ex. vanilla extract, orange extract, etc.) or cocoa powder to add flavor. Reduce the frequency of desserts. Try to limit yourself to a few times a week and when you do have dessert, truly savour and enjoy it. When you crave something sweet, have a piece of fruit or a few squares of dark chocolate. *Throwback to the good old days. Remember Calvin&Hobbes? Did you know that certain starches act more like sugar than sugar does. Studies have been done and it’s been found that they have the same effect on your blood sugar as sugar does. In fact, there are some isocaloric starches like white bread, or even rice cakes, that increase your blood sugar even more than eating straight table sugar. Be mindful of what you consume and the effects it has on your body.